Internet2's "Toward Gigabit Libraries" project, funded by the Institute for Museum and Library Services (IMLS), aims to help close the digital divide that persists in small, rural, and tribal libraries. Through this project, Internet2 has created a "Broadband Toolkit" and customized "Broadband Action Plan" to help librarians learn about their broadband infrastructure and internal information technology (IT) environment. The goal of the project is to enable librarians to improve their broadband services and become stronger advocates for their libraries' broadband infrastructure needs. 1 Why a Broadband Toolkit for Rural and Tribal Libraries? Broadband connectivity is a vital element of thriving communities. The IMLS vision for the "National Digital Platform" as a rich interoperable environment of tools, data, and services provided at a distance is dependent on ubiquitous broadband capabilities  to all libraries, museums, archives, and allied institutions, regardless of their geographic location. Scalable, affordable, high-quality broadband to every library in every community is necessary for patrons and staff to access the National Digital Platform, enabling them to better focus their resources, energy, staff, and community expertise on curating and sharing their unique local collections. In addition to broadband infrastructure, the technical skills necessary to contribute to the National Digital Platform are currently lacking in many rural and tribal libraries.1 Additionally, most U.S. libraries are very small, and almost half are located in rural America. Per the 2012 Public Libraries Survey (PLS), of the over 9,000 public library administrative entities in the United States, approximately 80 percent are single direct service outlet public libraries, not part of a consortium or system with IT-related support.2 Forty-five percent of the total are in geographic areas classified as rural-remote, rural-distant, or rural-fringe.3 On average, public libraries with a rural locale classification have a 0.5 full time equivalent (FTE) librarian with a Masters of Library and Information Science (MLIS) degree (nationwide average is 3.4 FTE).4 In rural-remote libraries, that average drops to 0.17 FTE. The average public library in the United States has total FTE staff of 14.76. Rural libraries have an average staff of 3.56 FTE. Clearly, these libraries have very limited staff resources available and are even more limited in terms of technical resources. The IMLS-sponsored "Toward Gigabit Libraries" project aims to strengthen librarians' technical broadband skills and to empower rural and tribal library practitioners to become more savvy and effective consumers, advocates, and providers of high-quality Internet access and digital services to the communities they serve. 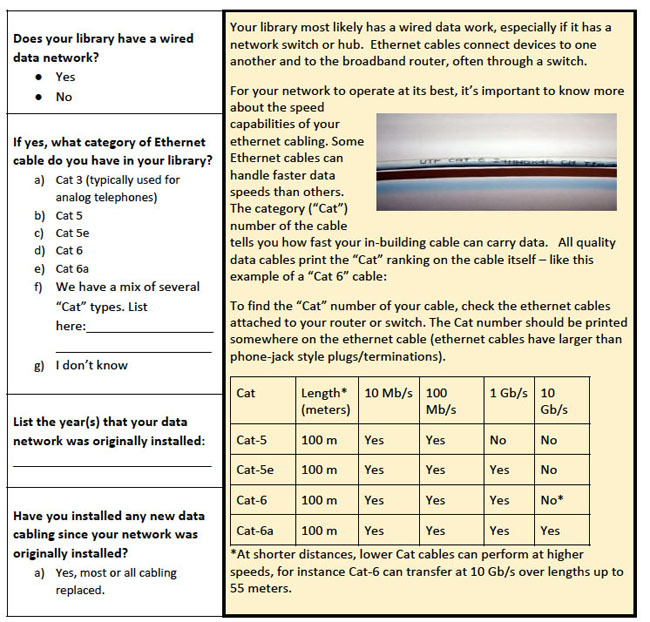 To do this, the project team has created a combined library assessment and librarian training workbook, known as the "Toolkit," to walk library practitioners through their broadband infrastructure and related devices in their libraries. What is the type, size, cost, and provider of my current Internet connection? Is my library getting the bandwidth throughput it is paying for? What are the various types of Internet connections available and who provides the various services in the area? What is the best option for meeting the library's current and future bandwidth demand? Is the library's interior network wiring and wireless infrastructure sufficient to meet current and future demands? What can be done to improve internal connections to advance the library's Internet access? Pilot Site Selection: The Internet2 grant project team will work with the State Librarian Office, area tribal organizations, and R&E network partners to identify target pilot libraries. These libraries will be invited to participate in the pilot and asked to provide additional information and schedule a four-to-six hour on-site pilot visit. Intake Survey: A staff member from the library will be asked to fill out an "intake survey" to help the grant project team and technical advisors better understand the library broadband environment. Pilot Visit/Toolkit: A technical advisor (either a member of the grant project team, state-based resource from the State Librarian's Office, technical staff member from the R&E network in the area, or another technical resource) will visit with the library staff member at the library to go through the toolkit. During the process, the technical advisor and library staff member will identify areas for library broadband improvement and areas for improvement for the toolkit. Broadband Improvement Plan: During the pilot visit, while working through the toolkit, the technical advisor and library staff member will identify short- and long-term actions to be documented in the Broadband Improvement Plan. This plan will also be shared with the grant project team in order to identify common action item areas, "quick fixes," and strategic longer term action items across the pilot participants. Post-Pilot Survey: The library staff that participated in the pilot will be asked to participate in a brief survey to elaborate on their experience with the toolkit and overall pilot process (for example, what was learned, what was improved in their library's broadband infrastructure) and to provide candid, anonymous feedback about the toolkit process and materials. The toolkit is designed is to be "hands on," with the library staff looking at and touching the various components of the broadband infrastructure and IT environment in the library. 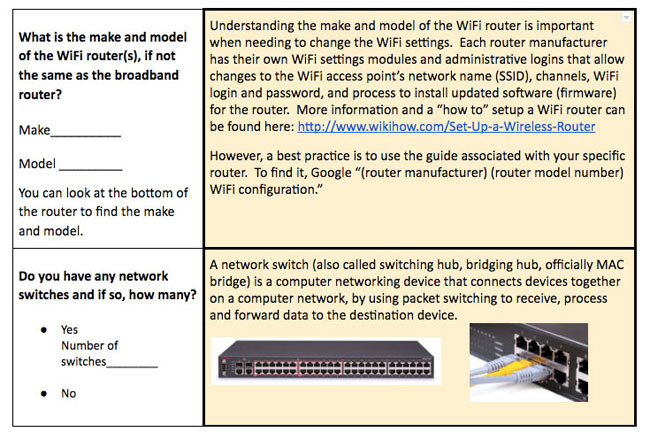 Topics in the toolkit vary from the actual broadband connection speeds and quality of service, to routers and inside wiring, Wi-Fi access points, and the various computers or other broadband peripheral equipment leveraging the network. Each of these topics includes questions and short, non-technical overviews, delivered via short narratives, diagrams or pictures, videos, and/or links to information resources. Although the 2017 pilot visits include outside assistance for the library, the aim of the project is that the toolkit functions as a stand-alone resource, usable by a layperson. At the end of the project, after the pilot experiences help to further refine the toolkit and the training resources, the toolkit and related materials will be available for public uses under a Creative Commons license. The Toward Gigabit Libraries project is building upon the Edge Initiative's toolkit approach; related IMLS- funded efforts, such as Building Digital Communities: A Framework for Action; Inclusive Gigabit Libraries; and other work funded by the Broadband Technology Opportunities Program (BTOP) in Colorado to develop and pilot the use of a library broadband health assessment toolkit for rural and tribal libraries. The intent of this toolkit and hands-on training program is to pilot the use of a training framework around broadband delivery best practices, targeted initially towards rural public and tribal libraries. But this work could potentially scale nationally to all libraries regardless of their size or geographic location. Further, this project intends to leverage the deep, technical expertise of the R&E community to help develop this library broadband assessment toolkit and pilot its use with library practitioners in rural public and tribal libraries across the country. The Internet2 community, which includes more than 300 higher education institutions and 44 regional R&E network partners, has worked as a trusted partner with community anchor institutions (CAIs) to provide advanced networking connectivity and technical expertise for nearly two decades. Today R&E networks connect more than 93,000 CAIs across 44 states, including one quarter of our nation's public libraries. The Internet2 R&E community is uniquely positioned to work together with rural and tribal libraries to assess their current broadband infrastructure, identify common networking problems, and suggest ways to solve them. Partners from the R&E community, serving as subject matter experts to help guide the project and serving as technical advisors, include Florida State University iSchool, KanREN, Network Nebraska, OneNet, Pacific Northwest Gigapop, and University of Texas in Austin Information Policy Institute. As the project is focused on two underserved populations in terms of library services and broadband  rural and tribal libraries  other key project partners representing those areas also are acting in a subject matter expert role and in some cases as technical advisors. These include: Affiliated Tribes of the Northwest Telecommunications Technology Committee; Alaska State Library; American Library Association; Office of Information Technology Policy; Association of Tribal Archives, Libraries, and Museums; Chief Officers of State Library Agencies; Idaho Commission for Libraries; Nebraska Library Commission; Oklahoma Department of Libraries; and Southern California Tribal Chairmen's Association, Tribal Digital Village. The focus of the project to date has been the development of the toolkit materials and preparation to pilot their use in select libraries around the country. Internet2 began by conducting primary and secondary research to further identify and understand library broadband technology issues and needs, particularly in rural public and tribal libraries. Internet2 then assembled a diverse panel of subject matter experts (SMEs) from the organizations named above and tasked them with providing insight and information on various issues, such as tribal library spaces and library use of E-Rate, to help focus development of the toolkit and its components. In May 2016, Internet2 hosted a SME workshop to review draft toolkit materials and discuss the toolkit and project process. Site visits in pilot libraries began in March 2017. A key finding the team discovered early on was a necessary tension in the design of the toolkit itself between the need to be friendly enough for any layperson to use but also with enough technical information to make the experience worthwhile  and one that would lead to actual improvement. This tension was echoed when the toolkit was refined during the gathering of SMEs. The SMEs discussed language and presentation methods that would encourage library workers to work through the toolkits and gain self-confidence in the process. The project team is currently working with partners in several pilot states to select the libraries that will be involved in the pilot project and scheduling time for the technical advisor to visit the libraries. Together with the library staff members, the project team will conduct the approximately four-hour site visit to go through the toolkit and look for opportunities to both improve the library's broadband performance and the toolkit itself. The goal is that the toolkit will support and promote rural and tribal librarians' understanding of their broadband infrastructure to ensure it is optimized to meet local community needs and enable local contributions to the development of the National Digital Platform. Further, the intention is that the education and training opportunity that the toolkit provides to library staff will be a means to help them better advocate for their libraries broadband and technical needs in their communities  to ensure that their libraries have equitable access to the National Digital Platform. 1 Miriam Jorgensen, Traci Morris, and Susan Feller. 2014. Digital Inclusion in Native Communities and The Role of Tribal Libraries. Oklahoma City, OK: Association of Tribal Archives, Libraries and Museums. 2 Swan, D. W., Grimes, J., Owens, T., Miller, K., Arroyo, J., Craig, T., Dorinski, S., Freeman M., Isaac, N., O'Shea, P., Padgett, R., & Schilling, P. (2014), Data File Documentation: Public Libraries Survey: Fiscal Year 2012 (IMLS-2014–PLS-02). Institute of Museum and Library Services. Washington, DC, p.135. 3 Swan, D. W., Grimes, J., Owens, T., Miller, K., Arroyo, J., Craig, T., Dorinski, S., Freeman M., Isaac, N., O'Shea, P., Padgett, R., & Schilling, P. (2014). Data File Documentation: Public Libraries Survey: Fiscal Year 2012 (IMLS-2014–PLS-02). Institute of Museum and Library Services. Washington, DC. p.147. 4 Swan, D. W., Grimes, J., Owens, T., Miller, K., Arroyo, J., Craig, T., Dorinski, S., Freeman M., Isaac, N., O'Shea, P., Padgett, R., & Schilling, P. (2014). Data File (Public-Use): Public Libraries Survey: Fiscal Year 2012 (IMLS-2014–PLS-02). Institute of Museum and Library Services. Washington, DC. Susannah Spellman serves as the Executive Director of the United States Unified Community Anchor Network (U.S. UCAN) program at Internet2. U.S. UCAN is focused on efforts to support the broadband needs of community anchor institutions nationwide. In addition to Internet2, she has worked in telecommunications for the last 20 years for Booz Allen Hamilton, Detecon, Telcordia Technologies, and IBM and holds a B.A. in Telecommunications from the Pennsylvania State University and a M.A. in International Science and Technology Policy from George Washington University. James Werle serves as the Director of the National Internet2 K20 Initiative which brings together Internet2 member institutions and innovators from public libraries, primary and secondary schools, colleges and universities, and museums to extend advanced broadband-enabled technologies, applications, middleware, and content to all community anchor institutions. He began his career as a Peace Corps Volunteer teaching physics and building a library and science lab in the small Central African nation of Malawi. He also worked at the University of Washington where he helped launch the Washington Digital Learning Commons, a statewide K-12 online learning consortium. He holds a BA in science education and a Master's Degree in Library and Information Science from the Ischool at the University of Washington. Carson Block has lead & loved library technology efforts for more than 20 years  as a library worker, IT Director and Library Technology Consultant. Carson is a Director-At-Large for the American Library Association's Association of Special and Cooperative Library Agencies (ASCLA) and is a past Chair of ASCLA's Library Consultant's Interest Group. He is also a member of the Future of Libraries advisory group to ALA's Office of Information Technology Policy. Carson is also Past President of the Colorado Division of the Public Library Association.